It’s the latest addition to the Roller Team range of competitively priced A-class motorhomes. It’s only 5.99m from bumper to bumper, yet its proportions are right. And its price is a major attraction, rolling out (sic) at £10 short of £60,000 – and free of the optional packs and extras that so many manufacturers hold back to make you spend often a whole lot more. Meet the Pegaso 590. Advantages of an A-class? 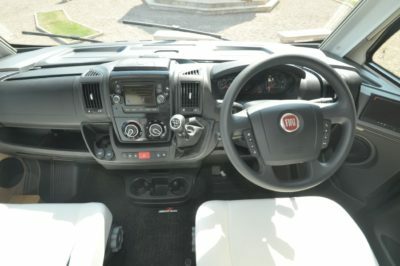 Superior insulation, more interior space (thanks to the bodywork extending to all four corners), plus that larger cab area – with its bigger windows – meaning superior views out, whether travelling or when parked up. Disadvantages are few. In truth, despite appearances they’re no wider than their more traditional coachbuilt counterparts. Typically, the price premium of an A-class is the main barrier to purchase – that’s hardly the case here. So, what do you get for your money? Apart from its diminutive size, there’s little on the outside to suggest compromise. Bodywork is a timber-free construction, GRP-clad with Styrofoam insulation in between. There’s a 10-year bodywork integrity warranty. Also, a five-year habitation warranty. Note, also features from the coach-style mirrors to driver’s door (on the right side for the UK). 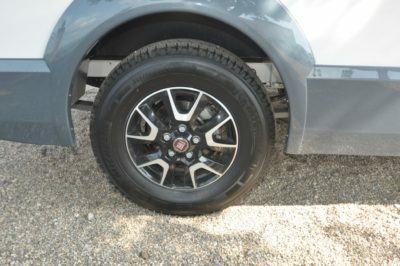 The alloy wheels, bike rack for four, reversing camera and solar panel are also standard issue. Maximum weight is 3,500kg and there’s a more than decent 600kg-plus payload. 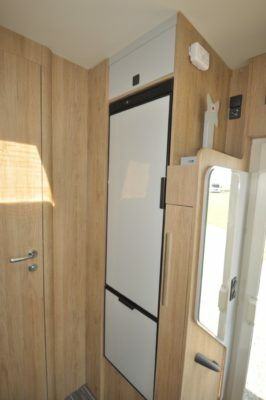 The habitation door is on the UK nearside (still a rarity on so many motorhome imports, generally) and there’s a low step-in height. 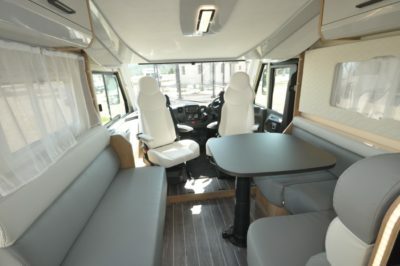 The floorplan borrows heavily from its low-profile coachbuilt sister model, the T-Line 590, albeit the enhanced cab area here comes with easy-to-swivel captain’s style seats as well as a generous (1.85m x 1.34m) pull-down double bed, with the usual one-piece mattress on a slatted base. At floor level, the lounge offers L-shaped seating and a settee, with a sturdy fixed pedestal leg table that can be adjusted sideways as well as for height. The upholstery is Eco leather and Roller Team has lightened the furniture finish for all three of its Pegasos this season. UK tastes are catered for in the kitchen. It doesn’t take up a lot of room, but the main unit is all the more space-efficient for being L-shaped. The Thetford oven/grill will no doubt be considered an essential. It’s complemented by a three-ring “triangular” hob and circular sink, the latter with loose covers that help compensate for an obvious lack of worktop. 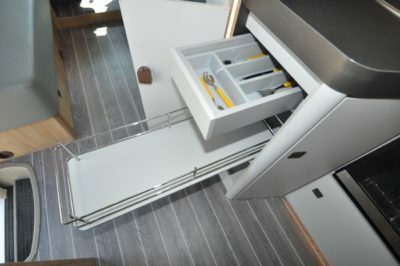 Storage is good, however, with some neat touches including a cutlery drawer and slide-out section in the locker under the sink. Beyond the kitchen, the washroom takes up the whole back end. 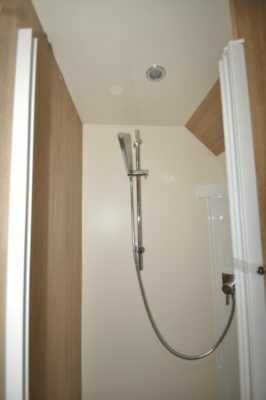 There’s a separate shower cubicle, fixed basin and Thetford swivel-bowl toilet in here, as well as a wardrobe that’s the upper part of a tall locker that can also be accessed from outside. Fold-down shelving keeps it flexible in terms of what you want to stow in here. It’s certainly not short on specification. 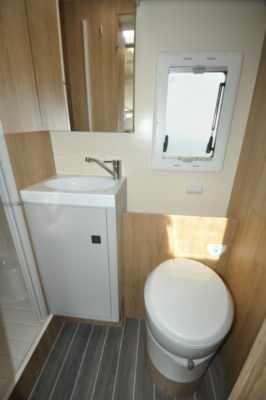 Heating and hot water are courtesy of Truma’s Combi 6 system, the habitation door comes with full flyscreen, plus there’s cab air conditioning, 100-litre fresh and waste water tanks, 95Ah leisure battery, stereo radio/CD system with 5in touchscreen, plus sat nav, and plenty more. Of course, Roller Team’s place at the top table of the Trigano Group – where it can count the likes of Adria, Auto-Sleepers, Benimar, Chausson and Tribute among its siblings – can only help. Don’t forget, also, Roller Teams are marketed and distributed in the UK by Auto-Trail. Rather ironically, then, it’s the lack of sub-£60,000 A-class competitors that might hold back sales of the Pegaso 590 in the UK. There’s more information on the Pegasus range on the Roller Team website. Find out more about insuring this or your current motorhome on our motorhome insurance discounts page. 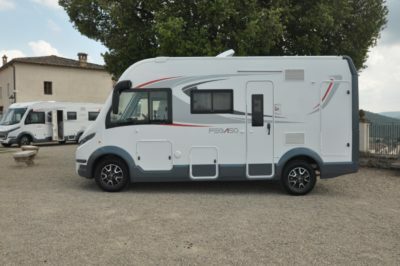 *Motorhome insurance cost based on Roller Team Pegaso 590 motorhome retailing at £59,990 with electronic immobiliser, Cat 1 alarm and rear view camera. UK travel only. Kept on driveway at home at TD9 8ED. Motorhome owners – professionals over 50 years old with no claims, convictions or health conditions in last 3 years. 4 years no claims bonus mirrored from car policy and 2 years motorhome driving experience. Members of motorhome club doing less than 5000 miles annually. £350 excess applies. Premiums include insurance premium tax at 12% and are correct at 02.10.18. 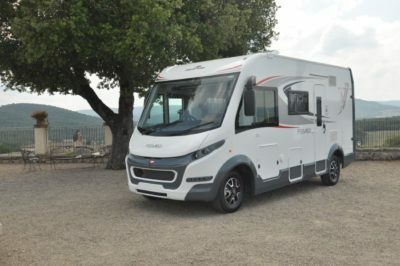 Happy motorhoming in your new Pegaso 590 Bill. fairly detailed report,however i would have liked chassis spec too. This motorhome is has a very similar layout to my T- Line 590. I don’t think this model would encourage me to upgrade. 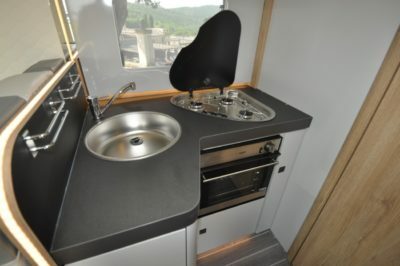 It is a lovely motorhome with quality finishing and its appearance looks great. Great shape, a wheel, almost on each corner too. What is the weight of 4 bikes and how can that become a storage box on the rear holding the same weight but storing other things? The designer has a good eye for form and shape, utility I suppose. Our Highline T6, E6, is a builders van, with off road capability, a Kombi DSG, 150 bhp, which drives like a Mini Cooper S, great for towing our 10 year old Eriba Troll. This vehicle looks like it might have rough road if not off road ruggedness. What would a four wheel drive version look like.